The Senate majority leader's office apparently has suffered its second bioterror attack in three years, with another suspicious white powder delivered through the mail system — this time laced with poisonous ricin, officials said. Sen. Bill Frist's staff discovered the white powder in their Dirksen Senate Office Building mailroom Monday afternoon. As the Senate opened its session Tuesday, Frist, R-Tenn., said a test confirmed "that this was ricin," but added none of the substance has turned up outside his office. "All air sampling and all environmental studies today are negative with the exception of what was found in that single office at that site," he said. Law enforcement sources are stressing that definitive test results are not back yet for the suspicious substance, and are not expected until later in the day, reports CBS News producer Kathy Mountcastle. The federal Centers for Disease Control and Prevention says officials are somewhat reassured because no one has turned up ill on Capitol Hill. Two out of three tests conducted on the powder have indicated ricin. The third test came out negative, and a fourth, more definitive test was under way, with results expected Tuesday. Charles Dasey, a spokesman at Fort Detrick, Md., said scientists there were doing a "confirmatory" test on the substance. The test is "higher reliability" but will take longer, he said. President Bush was briefed on the situation, and the administration established an interagency team to investigate what Frist told colleagues was a chilling crime. "Somebody in all likelihood manufactured this with intent to harm," he said as the Senate prepared to open debate on a $317 billion highway bill. "This is a criminal investigation," Frist said. Special police units rushed to the Dirksen building Monday night, reports CBS News Early Show Correspondent Thalia Assuras. Sixteen people on the floor were decontaminated, and others who might have been in the area were urged to contact Senate officials, Capitol Police Chief Terrance Gainer told reporters at a late Monday night news conference. But there were no reports of anyone becoming sick, said Senate sources speaking on condition of anonymity. If symptoms of ricin poisoning have not surfaced in about eight hours, contamination is unlikely, said Frist, a surgeon before his election to the Senate. Capitol Police advised lawmakers not to open any mail. One reason that all three Senate office buildings were closed was to give authorities an opportunity to check senators' mail, one source said. In Connecticut, meanwhile, a postal worker found an unidentified powder leaking out of an envelope addressed to the Republican National Committee, and inspectors were trying to identify it. The powder was found late Monday at the Wallingford postal sorting center, the same facility where anthrax spores were found in 2001. Nobody was taken to the hospital and the facility remained open Tuesday morning, police said. The Wallingford facility is the same postal center at which investigators found anthrax spores in 2001. The substance found Tuesday has been taken to the state forensics laboratory for testing, officials said. A clue to ricin poisoning is a suddenly developed fever, cough and excess fluid in the lungs, a fact sheet from the federal Centers for Disease Control and Prevention says. These symptoms could be followed by severe breathing problems and possibly death with two or three days, the CDC said. There is no known antidote. Twice as deadly as cobra venom, ricin, which is derived from the castor bean plant, is relatively easily made and can be inhaled, ingested or injected. Gainer said they were still investigating how the powder got into the mailroom. The Homeland Security Department was monitoring the situation, spokesman Brian Roehrkasse said. An FBI official said the agency was awaiting a final test from a laboratory at Fort Detrick, Maryland, before deciding whether to get more fully involved in the case. Frist gave no indication that extra security had been ordered for the Capitol complex, although security in the area has been high since the Sept. 11, 2001, attacks. Democrat Tom Daschle of South Dakota was majority leader in 2001 when deadly anthrax was found in letters sent to his and Sen. Patrick Leahy's offices in the Hart Senate Office Building. Letters were also sent to NBC and a newspaper's offices in Florida. The anthrax letters killed five people and sickened 17 others. There have been no arrests in the case. 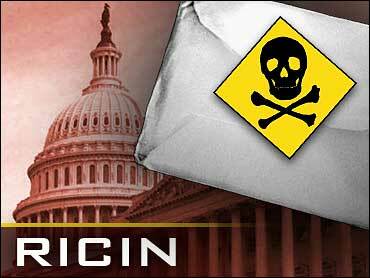 Mail to congressional offices has been irradiated since the 2001 anthrax attack, but Frist said radiation is unlikely to have an effect on ricin. In October, a package containing ricin was found at a postal facility serving Greenville-Spartanburg International Airport in South Carolina. No suspects have been arrested and no illnesses have been reported since the package was found. The postal center was temporarily closed while health officials tested it, but no signs of contamination were found. A letter inside the Greenville package said the author could make much more ricin and will "start dumping" large quantities of the poison if new federal trucking rules went in effect, according to information released by the FBI and other federal agencies. The rules, which require more rest hours for truck drivers, took effect last month. The letter, signed "Fallen Angel," said the author was "a fleet owner of a tanker company." The FBI has previously warned that some chemical and biological weapons could be improvised by terrorists using readily available materials. Examples include ricin. Police found traces of ricin in a north London apartment last January and arrested seven men of North African origin in connection with the virulent toxin that has been linked to al Qaeda terrorists and Iraq. In 1978, ricin was used by Bulgarian intelligence agents in London to assassinate dissident Georgi Markov, whom they pricked with a poisoned umbrella tip.